As promised, I popped down and slapped a second coat on the bits that I painted on Wednesday (apart from the water scoop handle, which got its first coat - again!). Also painted the spark arrester with heat-resistant aluminium paint. 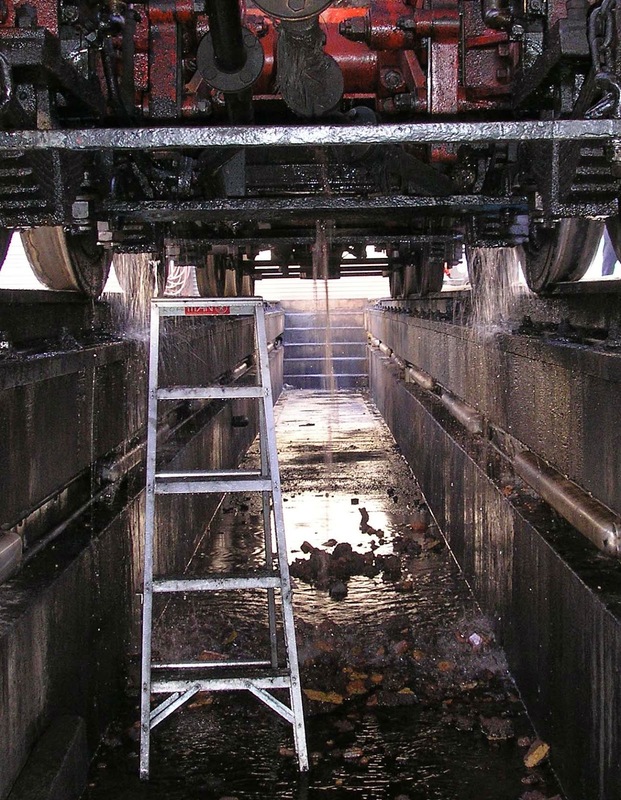 The morning was extremely busy, and after lunch 2807 was pulled out over a pit where the boiler wash-out took place. John T started the day by cleaning out the holes on the spark arrester mesh (that I had filled with silver paint!) before acting as gopher for me in the cab; also examined the angle around the firebox cladding in the cab, where the fixing rivets have disintegrated. But the day began for me with clearing out the brick arch debris. I was inside the firebox throwing lumps out to Gilbert in the cab; Gil was then passing them down to John, who was stacking the sizeable lumps neatly at the side of the shed. 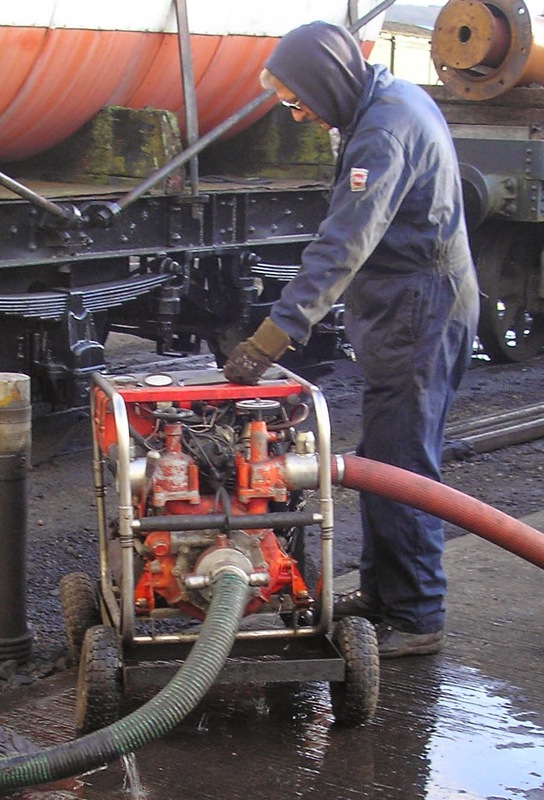 Later, John cleaned the threads on all of the boiler plugs and cleaned the mudhole doors. Even later, he assisted David & Bruce, measuring the lengths between brake blocks. Bruce cleaned up the nuts & bolts that fix the spark arrested, before moving on to the brakes. David & Bruce spent most of the day measuring the distances between brake blocks and the corresponding holes in the rods that link them, and figuring out what to do to move the holes into their correct positions. Gil & Brian applied some air to the lubrication pipe from cab to cylinders to ensure it is not blocked, and removed the atomisers to clean them, too. I spent most of the day inside the firebox cleaning the rivet heads around the foundation ring, and the nuts on the end of stays inside there. Pretty filthy work. Determined not to be prevented from continuing after lunch, I surreptitiously blocked the two holes in the firebox crown (i.e. put the fusible plugs back in!) to avoid me getting soaked while the Loco Dept chaps performed the wash-out. However, once they got into the cab to squirt water into the plugs and doors there, I figured that wisdom prevailed, and got out! I think that Gil assisted with the washout. Certainly Steve was manning the water pump, with a chain of command between him and the chap at the sharp end of the hose. Steve had earlier examined that angle in the cab and decided that, as it is impossible to get to the rear of these pieces (i.e. for a nut), they will have to be re-riveted. I took the LHS number plate off and the bell from the cab, because the lacquer on these was wearing out, so they needed cleaning up. Gil & Brian later met with the railway to discuss various things. We were unable to have our Supporters' Special even close to when we wanted it. So, Supporters Day will be Monday 18th May. Maurice had had a hooley during the night! The towels, tea-towels and flannels were all on the floor! It looked like the aftermath of a great party! 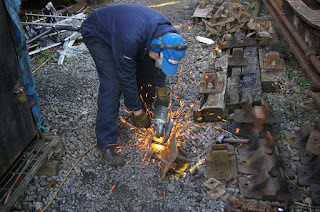 Having started in the firebox on Saturday, I decided to finish the job. The boiler inspector is coming on Wednesday, so it needs to be clean for his inspection. After helping me look for the power cable and wire brush that were not where they should have been, (Brian discovered them on the flat wagon outside!) he abandoned me; so I pressed on inside the firebox. After lunch, I slapped varnish-remover onto the brassware (bell & number plate) and persuaded the old varnish to depart. In the transition period between sleep and awake, by brain remembered that today is the day that the Flag & Whistle is re-opening … which means that I need some boot scrapers. So, I toddled off to Todders and cleaned up five rail chairs during the morning. While I was attending to their bottoms, I thought I could hear … yes, it's raining! The boiler inspector came and … well, inspected the boiler! He said that it was in generally good condition. There are five stays and a patch screw to keep an eye on, but if there's no change next year, then that's OK. 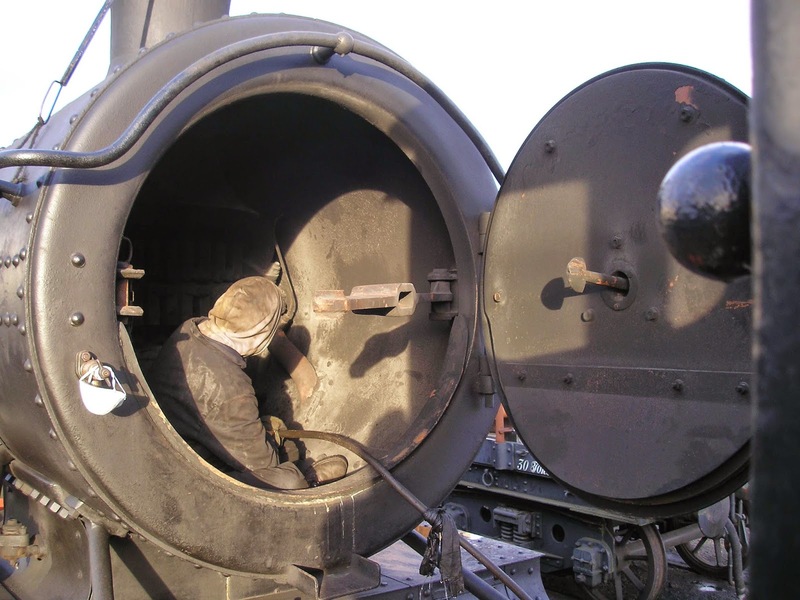 When he'd finished inside the firebox, I was able to clamber in and apply heat-resisting paint to the stay nuts and rivet heads that are on the foundation ring and are at burning-coal level. That took all afternoon. While waiting for him, I had checked that the new blow-down valve did actually fit on its studs .. it did. Bruce & I then chewed over how to fit the pipe to the bottom of the valve to exhaust steam vertically downwards, when there's a sander operating lever four inches directly below it! Bruce spent most of the day sitting on top of the boiler, lapping-in the clack valves and the safety valves. Gil removed one cylinder cover in order to measure the insides and check the gap around the piston head. It is allowed to be a quarter inch, whereafter a new piston head has to be procured. John T and also John G were assisting Gil - removing cladding to get at the cylinder cover, and then helping remove the cover. Later, John G cleaned up the two metal poles that sit either side inside the firebox acting as supports for the sides of the brick arch. They are interesting shapes! That's because they rest on studs on each side, and have to fit the shape of the sides. Clive (possibly with the help of others) applied a second coat of bitumen to the tender coal space. We discussed getting inside the tender in order to apply a coat of bitumen on the inside. Clive seems quite keen on finding some poor soul to do this! It's a tad claustrophobic in there; but at least we now have a fresh-air sucker/blower, so they won't have to sit in the fumes (as I did, some six years ago). Oh, I almost forgot - I applied a file to the leading damper lever to make it less of a struggle for the poor fireman to close the damper door! That was issue 44 sorted!